Lets start with the specifics – I came 7th, which turns out to be my best finishing position at The Fling. I also had the most in any bike race I have had for years. Any previously lost mojo seems to have been returned, with interest, and along with it came good(ish) legs and a carefree spirit. What finer place to start than the beginning? I was never going to race the Highland Fling. More than a few riders on Sunday morning said “your name wasnt on the startlist” – correct. It wasnt. 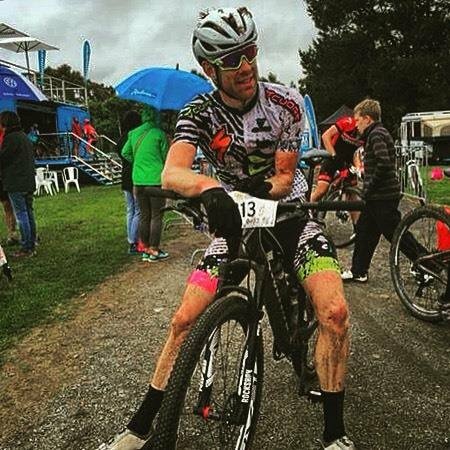 I raced at Kowalski – about a month and a half back – and then havent touched my MTB. Havent ridden it once. It got cleaned, and sat in the bike room waiting for action. I havent ridden longer than 3.5hours since then either. All my rides have been on the road, and short, with a bunch of Crit races thrown in. Not really ideal prep. On the startline I was chatting with Shaun Lewis about this and he helpfully (but somewhat optimistically) said “Fresh! You’ll be well rested”. Well rested indeed! Thursday was the point at which I had decided to race the Fling. Kyle had called to ask if i could help him out. He had good legs, but its a tough race to win against other teams – so he asked if I could come along and try to split the Specialized pairing of Lewis and Blair. With them together, it would be hard to beat them, but split them up and then it would be a race. All of this is easier said than done however. They are both great riders, and ride really well together. Sat morning I went out and rode 90km with my roadie bunch. I got on the scales after the ride and noted I had put on 2kg. I havent been doing much climbing, so havent been worried about it! Saturday arvo came around, and Kyle and I had decided to leave everything to the last minute. I got to his place at 4:30pm and we began changing tyres. After a quick trip to the local Woolies (I needed some gels!) we sat down for dinner at 6pm. It was a decadent dinner for pre-race as Mrs Ward had pulled out all the stops. Oysters, some pasta, and then some pears poached in red win. The pre-race food of kings! Hop in the cars, cruise to Bundanoon and rego 5mins before it closes at 9:55pm! Drive to field, set up sleeping bag in car, go to sleep. Race start was 7:35, so in the spirit of doing everything wrong, we decided to wake at 7am. At 7:15 we started to get dressed into kit, and before we knew it it was 7:30 and we were due on the start-line. We got there, back row, with no (zero) warm up. We hadn’t discussed race plans nor tactics. We know each other well enough to just ride. We can look at each others pedalling and know how things are going and what needs to be done. Its a useful skill, because it means we don’t need to talk too much. So essentially, everything that you wouldn’t want to do prior to the race – we did. Everything that you would have thought wasn’t correct. Gun goes and off we roll. From the very first few pedal strokes, it was clear what the plan would be. Shaun launched an attack from the gun (give or take) and I rode it down. Kyle and Blair sat in the wheels. Over the grassy, early hills, it was either myself or Shaun sending little testing moves. There were other riders with us, but it seemed as though they were there for something else. To give him credit, Dylan Cooper also sent a few testing efforts, and forced a chase from the Spec boys. This continued for almost the whole first stage. Big attacks, with the plan being to wear out the other rider or other team. Then it would sit up, relax, and go again. Off, on, off, on. It was obvious what was going down. Kyle had managed to get away with Blair – maybe 30secs. Neither I, nor Shaun, were keen on chasing that, so it left Dylan to do the work whilst we sat in. We rolled into transition, and it was a very much smaller group than I had expected. Maybe 5 of us. We rolled around to the next timing mat, and I just sensed that it was time to make our move. I should say that typically the front riders in the Elite field would wait and all roll off together. It just seemed like there was a moment that we could seize, and cause a fuss. I said to Kyle – lets go, now. We rolled over the mat and I launched it with pretty much everything. The long road all the way into Wingello, I had my hands on the crown of my forks, driving the pace. It was just Kyle on my wheel, urging me on. I looked under my arm and saw Blair chasing with everything he had. Just 30km into the race it was the decisive moment. I kept pushing and pushing, and went way way deeper than I normally would go at that stage. Just as it looked like Blair would join us, Kyle rolled off my wheel and attacked. I sat up, and he was gone. I took a breath, waited for Blair to come around and jumped straight onto his wheel. There was no Shaun. For a moment, I felt bad. Shaun is a good guy, and I know we must have caught him napping – but it was what we needed. Eseentially after that, I just sat on the wheel. We were caught by a couple of others (Marc Williams – who rode really well all day) but it was clear that was the race. coming out of the first real bit of ST, we had caught back up to Kyle. I knew what this meant – and as we caught him, just heading into the grassy double track climb before The Wall, I launched another attack. I knew that it would force Blair to chase, so I continued with the pressure over the crest and along the fireroad. He rode over again to me, and I was able to just cruise for a moment before getting my breath back. One final effort on the Fireroad before hitting ‘Wheres Wally’ ST, and the sketchy, soggy descent. All together, we hit the Wall. we all rode it fine, but it was here that I felt the effect of my previous work. I knew I would have about 90mins of strength, but that was it. They rolled away from me, and although Kyle tried to slow them on the ST to let me back on, I didnt see them again. From that point on, I was in a survival / just get home mode. Up front, Kyle had ridden clear, alone, and would go on to exit Wingello with 90seconds. I however was really hurting. The lack of miles in my legs was showing. Shaun caught me just at the end of the Red loop, and I hung on for as long as I could. Through the riders lounge together, and I knew I was in a spot of bother. I cracked on Halfway Hill, and just couldnt keep the pressure on. Relax, take stock, and enjoy. My work was done, and I had done what I needed to do. I hit the final transition and was riddled with cramp, but still in 5th place. At the creek crossing, I go to dismount my bike but my hamstring said “nah mate” and I screamed. I stood there for 5mins as tried to stretch it out and relax. Lewis rolled past and into 5th, and offered some words of support, as well as a little sledge. After that I just rode as best I could. Hanging on. I was comforted in the knowledge that there was no way Kyle wouldn’t win. He had the best legs, had a lead, and nothing would stop him. Just at ‘your choice’ in the final 3km or so, James Downing rolled past me, as I crept up the trail. I was now 7th. Thats how it would end. Turns out something did stop Kyle. As he caught back markers, with about 6km to go in full flight, they were on the trail, causing him to have to take to the long grass to get around. hidden in the grass was a big rock. It popped his tyre. That’s racing I suppose. He fixed it – slowly – and ended up in 5th. After the race I went and saw him. We high-fived. We had executed our plan, had the most fun we have had in ages, and really did what we could. The result wasn’t what we wanted, but sometimes that is secondary to what went on inside of the race. Well done to the three on the podium, they all rode incredibly well. People are always watching you dance, and yes, you will always blow up – but in between, you will have the most carefree fun you can imagine.